Any color you like... as long as it's Black! Automobile is a Martin Wallace game with a beautiful board and high quality components. Automobile carries you back to the birth of America's car industry, when inventors, craftsmen, and entrepreneurs created a wild array of marvels and misfortunes. Players select one of six pioneers from the industry, such as Henry Ford or Walter Chrysler to help them along in each of the four rounds. Players must build factories in order to produce the three general market classes of autos; mass market, middle-class, and premium-class. Accumulating Research & Development cubes will be necessary in order to build new factories that in turn will produce newer makes of cars. As new factories are built, older ones will need to be closed because, as in real life they become costly to maintain. Adding a parts factory will reduce your auto production costs. Additionally, there is a supply and demand factor. Players must balance the number of auto’s they produce with the changing demand within each market segment. Produce too many and you’ll incur loss cubes that cost you money. Now that you’ve produced fleets of cars, the question is can you sell them all? There are several methods available to make the sales, but the number of sales per method is limited. Some limits are obvious while other limits are not so clear until after the autos are built. Executive decisions allow players to get advertisement markers and discount markers. Advertising increases your car sales. Discounting increases your sales, but reduces the income from those sales. As in any good economic board game the player with the most assets at the end wins. Money management is critical at every step in the process. Strike the best balance, shift the right gears to best your rivals, and you'll be rich. Now, roll up your sleeves and start making cars! From the publisher, Mayfair Games, here is "Glover's" game overview. 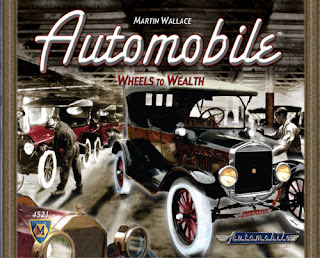 We have an open copy of Automobile available in our Store Demo Library for you come in and try out.